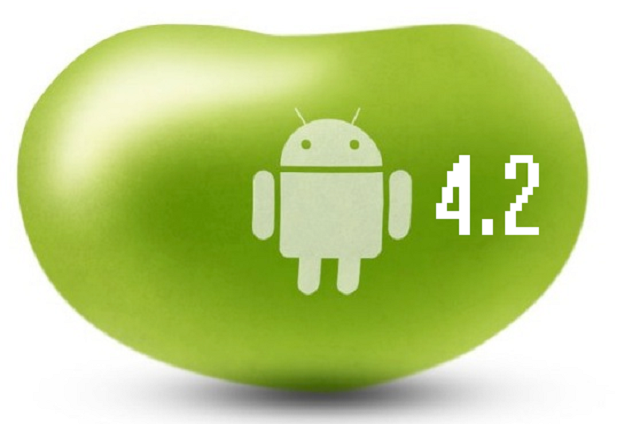 Google has released its Android 4.2 Jelly Bean update even after having to cancel its event this morning (thanks a lot, Hurricane Sandy). Google’s calling it “the simplest and smartest version of Android yet.” Here’s a quick look at all the biggest new features and improvements hitting the latest Nexus devices. 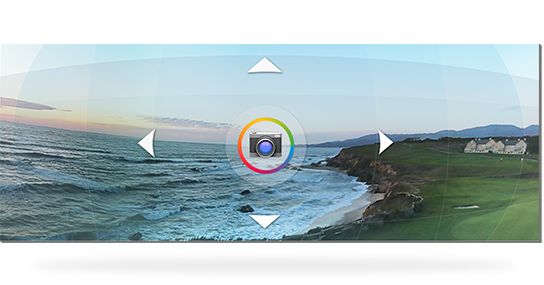 This camera feature upgrade now lets you take photos in any direction for 360-degree images. You can add these photos to Google Maps as well, if you want to share them with the whole Google-maps-using-world. It sounds a little like Google wants to give Android users a fun feature that also helps them crowdsource Street View for the world. Street View, in fact, served as the inspiration for Photo Sphere. Photo Sphere images are stored as JPEGs, and all metadata is transferable when you post them to the Web or email them. 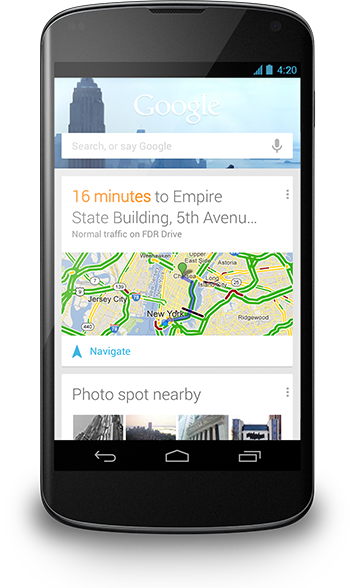 Android 4.2 brings faster, fluid typing to users with this new typing function. It sounds sort of like Swype on steroids: You simple glide fingers over the desired letters and the keyboard will predict the rest of the word, spaces, the next word, and even entire phrases. The dictionary has also been improved. Unfortunately, this isn’t a cross-device function, but tablet users will now have option of creating personalized login experiences. This means multiple users can share a tablet and still have a customized UI, their own apps, their own email connected, etc. Switching between different users is also simple and doesn’t require logging out each time. It sounds like a family-focused feature, and a smart one at that. 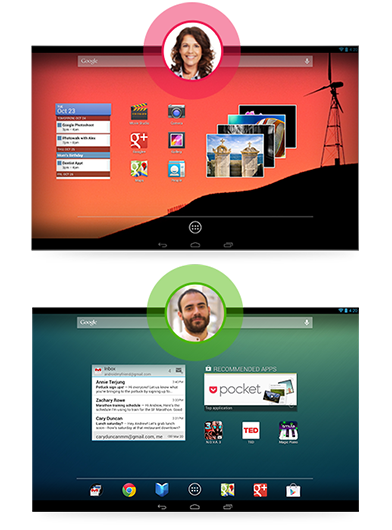 This capability would be nice, if rather unnecessary, in Android smartphones. A family or office tablet is a pretty common thing, whereas a shared smartphone… not so much. Now you can share multimedia content from your phone to your television wirelessly. You will, of course, need a wireless display adapter – but after that, you’re set, and can send videos or photos or whatever to your big screen. When Google first introduced us to Jelly Bean, the update to notifications was a fairly large one. They became more customizable and action-oriented, and that’s continuing with 4.2. Swiping down from the top of the screen brings up all your notifications, and from there you can immediately interact with the content. For example, if you’re late for an appointment, you can email everyone tied to that update that you’re on your way. The Google I/O conference marked the debut of Google Now, its first crack at besting Siri (a low bar, in all honesty, but a certainly a worthwhile effort). The native assistant app now gives you the day’s weather details first thing in the morning, as well as relevant transportation information depending on your location, without your having to request it. From the sounds of it, Google Now is simply getting better at predicting your needs automatically based on location, AI learning, and your search history. A bevy of new cards organizing and displaying all this data have been added, including: Flights, hotels, restaurant reservations, events, packages (shipping), movies, concerts, stocks, breaking news, nearby attractions, and nearby photo spots. In addition to some new flash and fun with features, this version also gets down to business with some heightened security features. Users now have the ability to control how much data apps are able to access from their smartphone, as well as VPN lockdown, which means you can keep information safe from being sent over a connection if it’s not connected to the appropriate server. And in order to fight recent malware complaints about Android, there’s an SMS confirmation feature that updates users about texts that may have been sent from their phones that they did not actually send themselves. Google Play has also instituted a native virus scanner called App Check, which will warn you before downloading an app that could be insecure.